Seashells are fun to collect and are our vacation souvenirs when visiting the beach. For those of us who live on, or near, the beach, our seashell collection can become quite large. Even though I only collect a few each time I'm near the water, my bowls are filling up. I've found some fun ways to display all my shells, whether they are whole and beautiful or broken and worn. Yes, I collect bits and pieces of shells. My shell collection contains big and tiny specimens and each size may need it's own place among the shelves and tables in my home. I have always wanted to fill glass table lamps with seashells. I have not purchased table lamps like these... yet... but one day. Fillable, transparent bases can be filled with anything, but seashells would look just perfect inside. In fact the description of these lamps claims that they come with shells! The link below goes to a set of lamps, but there are other single lamps, in varying shapes and sizes, to buy as well. 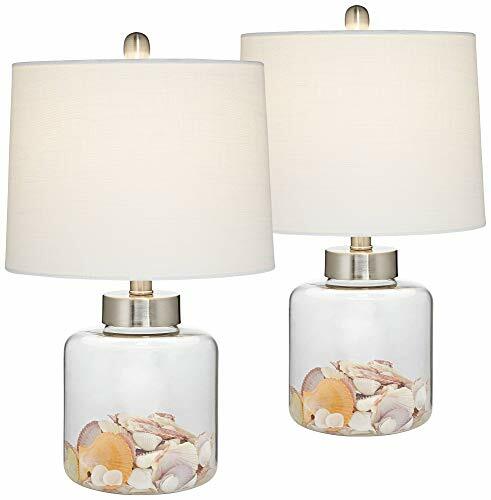 Fillable Glass Table Lamps For Collectables Like Seashells! These lamps come with decorative shells and customers give them 5 stars! 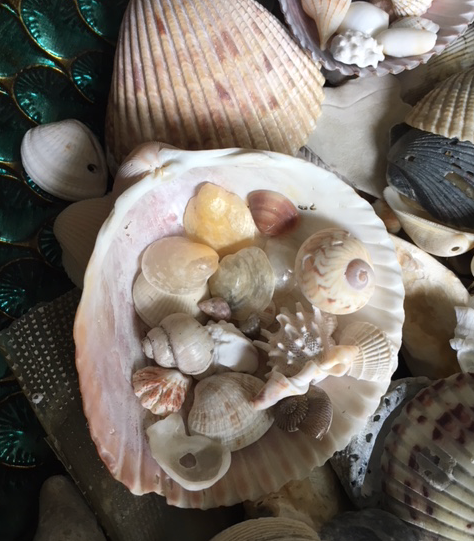 I live on a strict budget and I love the fact that I can find beautiful shells along the seashore, and use for free, to decorate my home. A big shell, placed on a shelf, table or windowsill, costs nothing. 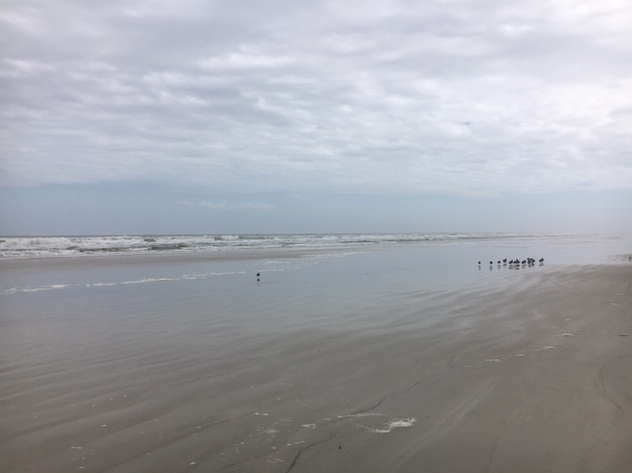 After learning a big about seashells, and writing my seashell blog, I know which shells to look for and which are rare finds in my area. From large shells like the Florida horse conch to tiny dwarf olives and juvenile shells, they all pique my interest. Sometimes I only take a photo and leave the shell where it is. This is always the case if the shell is inhabited by the snail, or mollusk, or has become a home to a hermit crab. This is the empty horse conch shell I found while boating. I had to chop off barnacles and get some of the brown coating cleaned off. Use large bivalves to hold smaller shells that could get lost in the collection. 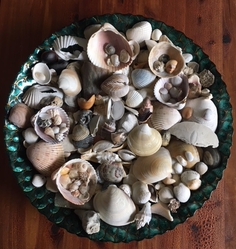 Another easy way to show off a seashell collection is to use a shallow, decorative platter or bowl. Search the dollar stores or yard sales for something plain and simple if you can't find something beachy. After all, the shells will be the main interest, not the bowl. I have a big round shiny blue-green bowl where I put my shells once they are rinsed clean and dried. The platter below, which is sold through Amazon, is the perfect example. Deep bowls, unless they are made of transparent glass, will hide most of the shells. A shallow tray can also hold a candle in the center, or put a large shell in the middle and surround it with smaller ones. In my photo here you can see that I use the half of a giant cockle shell as a holder for some smaller shells. 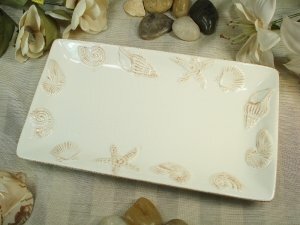 Any shallow platter or tray will allow all shells to easily be seen. Choose the wreath material for the base and craft a decoration for the front door with shells from your local beach. Grape vines grow in the woods all around me in Florida. I could go out and pull them down and make myself a base wreath - if I had the ambition. 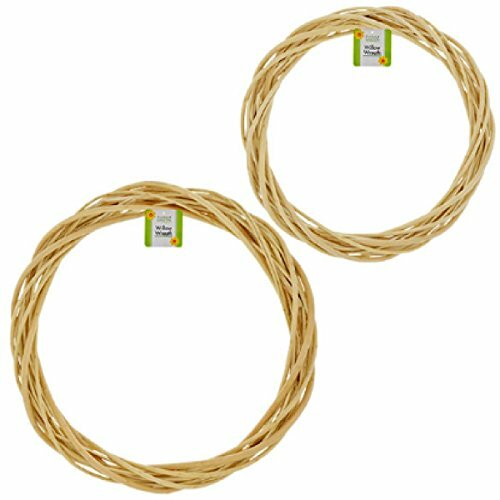 Coco fiber comes from the husk of the coconut, and willow is of course from the willow tree. 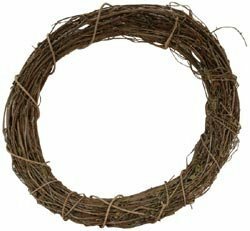 Begin with a natural wreath form, such as these, for best results. 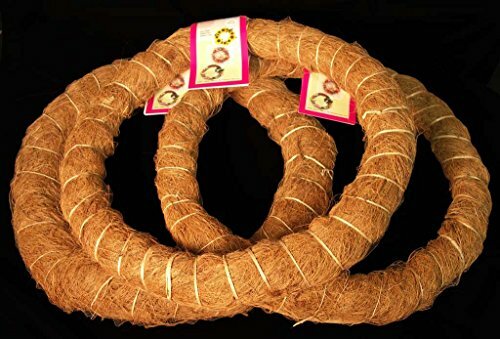 When using natural fiber, the entire wreath doesn't need to be covered. For wreath design inspiration, look around on the Pinterest site or check on Etsy. Search for "seashell wreaths" and the results will amaze. Use a glue gun or wire to attach shells and other items. Additional items can be added along with the seashells to enhance the tropical design. Items such as fish netting, tumbled beach glass, and fun signs with beach sayings, will add to the tropical theme of the craft project. The ones here come in packs of 2 or 3. Creating one of these is for the dedicated artist! The old time sailors valentine was purchased by traveling seamen during the 1800's as a gift to bring home to a sweetheart. While sailing in Barbados sailors would buy boxes that were decorated with local shells. Usually they were covered in glass within a box to keep them safe for the long journey. Today there are talented crafters who make seashell art which they call sailors valentines as they are made in similar fashion. The link in the section below will take you to my article where you will see some of the newer versions and meet the artists who make them. This page explains the Sailor's Valentine and may give the reader some ideas. You've probably seen wall mirrors with seashells glued all around the border. They are stunning, but could be a challenge to make and hang. Also the mirror itself would not be cheap to buy. Lots of seashells would be needed to create such a project. Glue a bunch of tiny shells to a special box. One big shell could be used as a handle to open the box. Glue the most beautiful shells to bureau or vanity handles. A single shell with a large aperture (opening) can hold q-tips or cotton balls in the bathroom (see my photo above). Scatter shells around the top of house plants to hide the dirt and pretty up the plant. 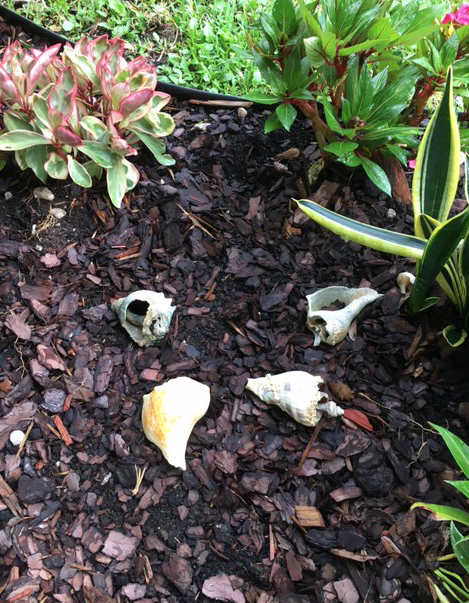 I add large, broken, and not-so-pretty, but definitely interesting, shells to my outdoor flower beds. 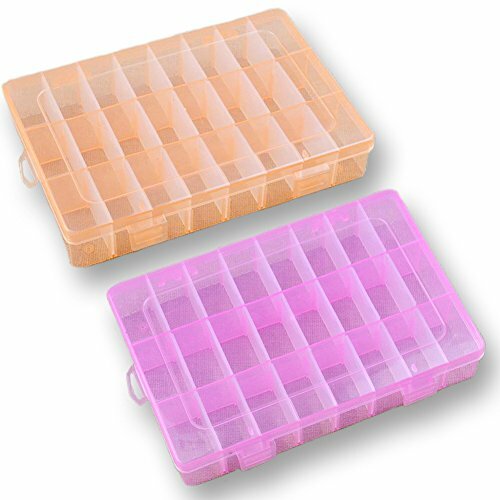 Small seashells can be stored in plastic craft boxes with clear lids. Whenever a craft requires organization of small items, such a box would be very helpful. The glue gun can't be beat when it comes to wreath making, and it's use doesn't stop there. 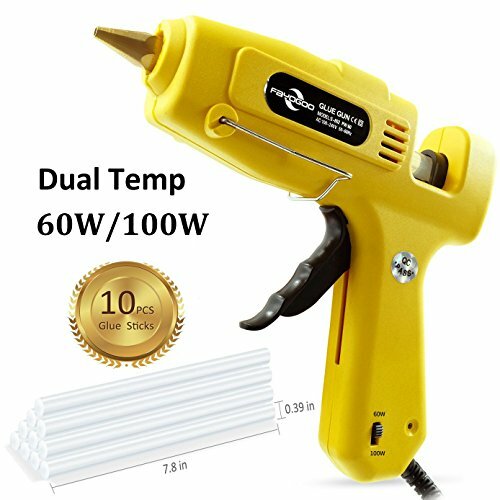 Glue guns don't need to be expensive. They all melt glue sticks and personally I don't see the need to pay a lot for one. 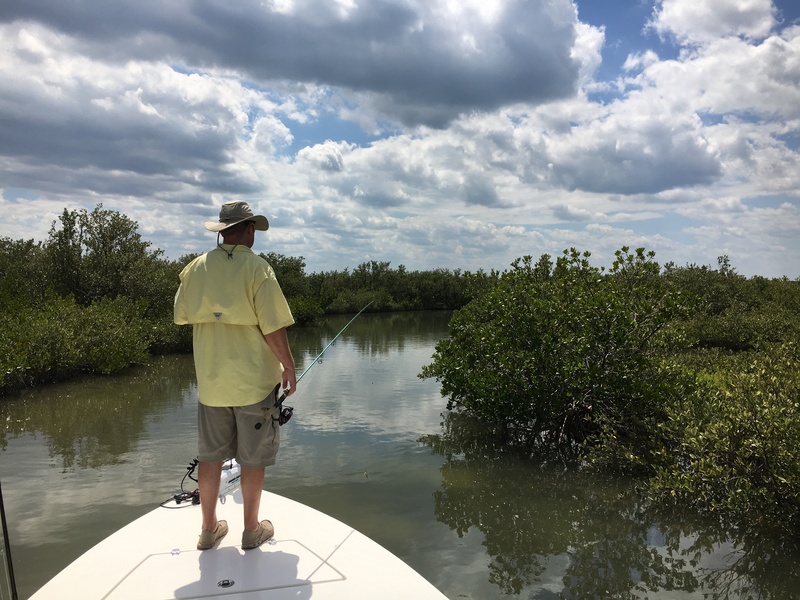 I also write about Florida and boating. 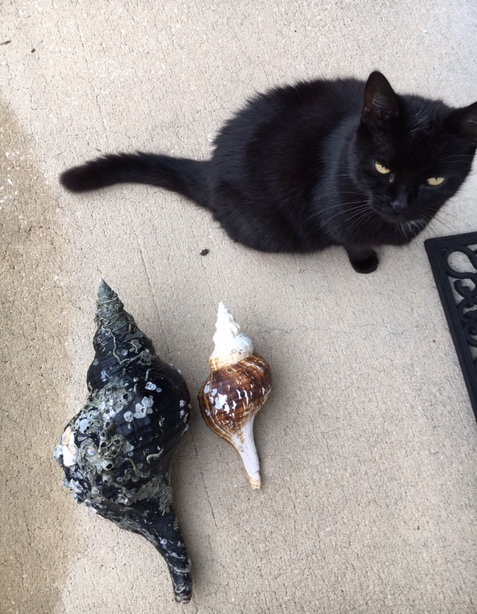 Please share how you show off your seashell collection. You seem to have an amazing collection of seashells and really know what to do with the beautiful shells. With the artistry, one can turn it to an object of home decor. I like the idea of using it with Glass Table Lamps - very creative. Shells are often for sale as souvenirs or to use as crafts. Many people, obviously, don't live near the sea to collect their own. Unfortunately, those types of shells were probably harvested while the animal was alive so the shell could be sold for money. My wife bought a bag of seashells put up by a designer. They are sold for decorations. I agree Kim, covering the shells in some way helps keep them looking clean and pretty. Lots of ways to use those shells! We don't get them around here, unless we travel to the shore. But I have some, and now I know what to do with them. I especially like the lamps, where they're protected from dust. Thanks! I did not know of the little hole often found in shells. Often shells already have a nice little hole in them which would make them easy to attach to something, and use as jewelry. No drilling required - even today! It is very likely that shells are among the earliest forms of jewellery and were used long before people developed the means to drill into stones.